Toronto Artists Collaborate for Collective Art Installation. 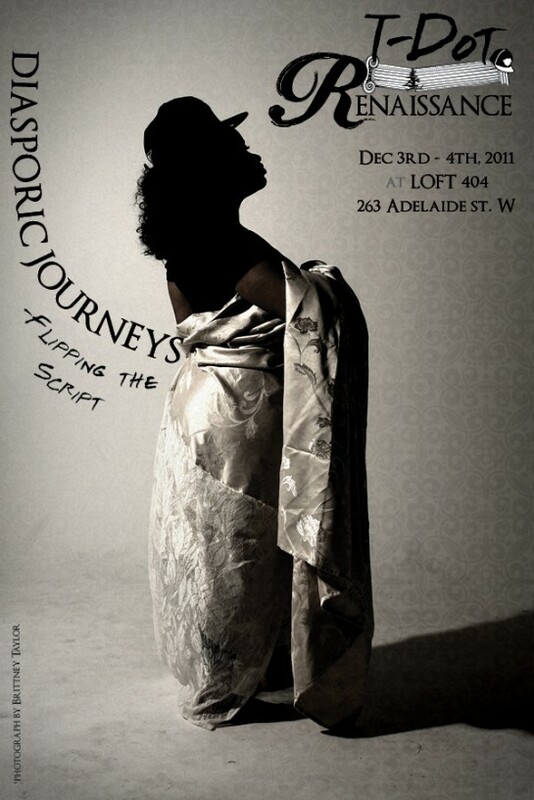 T-Dot Renaissance announces it’s first-ever collective art installation exploring diasporic journeys, from December 3-4th, 2011 at Loft 404 (located at 404-263 Adelaide St. West). Join us in this experiential exhibit, where all guests will be invited to walk through our interactive space at their own pace, and take the journey with us! T-Dot Renaissance represents a group of emerging and interdisciplinary artists, working and rooted in Toronto. Emerging from the successful staging of Amanda Parris’s theatrical production, 32C and inspired by the artistic movement of the Harlem Renaissance, this group of artists became inspired to further collaborate, by putting together interactive and interdisciplinary installations that would see their collaboration reach new depths. T-Dot Renaissance seeks to tell the stories that are not told, to give voice to those often silenced, and to encourage a kind of collaborative effort that is often missing from today’s individualistic and product-driven art market. This installation will trace the journey of so-called “third world” bodies they move across space into the “first world.” Through poetry, photography, film, painting, sculpture and dance, the artists will “flip the colonial gaze” and tell a new story; one that is embedded in critique, challenge, memory and survival. Featured Artists: Colanthony Humphrey, Natasha Daniel, Neil “Logik” Donaldson, Nadijah Robinson, Quentin Vercetty, Nayani Thiyagarajah, Kim Crosby, Myk Miranda, Camille “Ciel” Lauren, Keisha-Monique Simpson, Jamiena Shah, Kemba King, Alana Lowe, Alix Muyoti and Kayla Carter. The collective T-Dot Renaissance is extremely thankful to the Ontario Arts Council for their support of the team’s collective efforts, and to Loft 404 for providing a beautiful space for the installation. We encourage people to follow us on twitter.com/TDotRenaissance, check out our Facebook event, and visit tdotrenaissance.squarespace.com for regular updates on all installation news. This past Friday Montreal and Canada’s hip-hop scene lost one of its most important stalwarts. Matt ‘Dutch’ Garner was a promoter and founder of EscapeMTL.ca. Current reports state he, along with another victim, were killed when purposely set ablaze during a dispute last Friday evening. Personally I knew Matt via back and forth emails with respect to music coming out of MTL’s local hip-hop scene. His death is a huge blow to that city’s movement – but most importantly an extremely tragic one based on the reported circumstances. 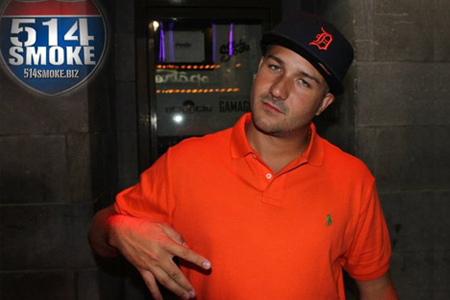 Our condolences go out to Matt’s family, friends, loved ones, and the entire Montreal hip-hop community. Rest in peace Matt ‘Dutch’ Garner. For more details check the links below. If you haven’t been to one of Tara Muldoon’s “F-You” events, this would definitely be a good time to start. 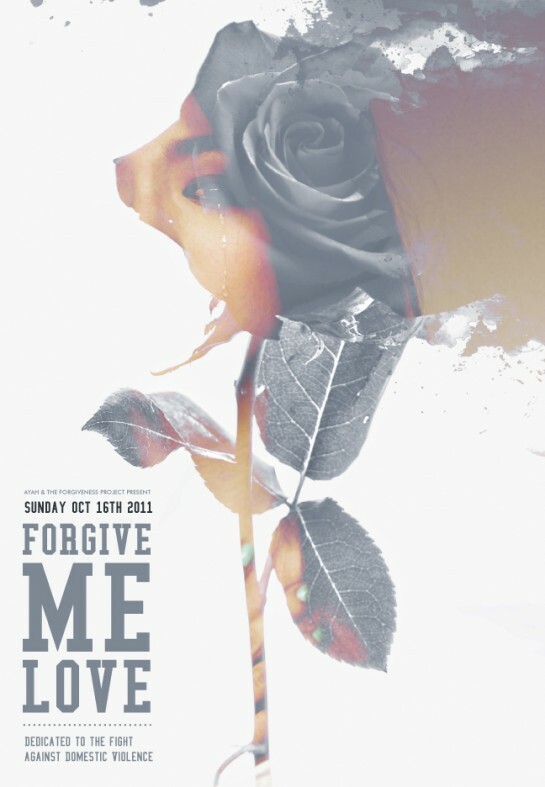 Not only will there be a very frank discussion revolving around the lives of some extremely brave members of our community – Ayah will be debuting the visuals for her latest single “Forgive Me Love” off her “Back For More” collabo project with DJ Jazzy Jeff. Should be a great, inspiring and empowering evening. Full details after the jump! 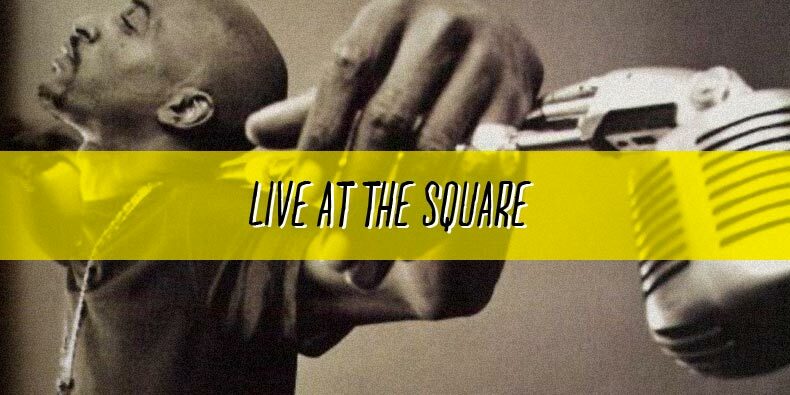 Manifesto’s “Live At The Square” includes main-stage performances, a bboy/bgirl open dance floor, graffiti wall and open canvas artwork, the Freshest Goods Market, workshops, and more. Sunday’s all day outdoor block party transforms Yonge-Dundas Square into Toronto’s multidisciplinary urban arts playground backed by a free concert showcasing some of Canada’s musical legends and emerging talent, alongside a handful of international guests. Full day lineup and performance times after the jump! 11 days. 14 events. 100+ artists. One city. Celebrating our significant 5-year anniversary for this upcoming edition, the Manifesto Festival of Community & Culture returns this year with an 11-day long festival featuring an unprecedented series of events including the ArtReach Pitch Contest, FRESH (New Artist Showcase), the 106 & York Urban Arts Festival, Wombmanifesto, Origins (an Indigenous Hip Hop Showcase), Manifesto Movie Night, the Red Bull Music Academy Culture Clash, a Conference on Community & Career, a Street Dance Tribute and many more. In Manifesto tradition, the festival will culminate on Sep 25 with a massive FREE outdoor concert at Yonge-Dundas Square headlined by Rakim & Kid Capri, 9th Wonder & Phonte, Blu & Exile, Andreena Mill, Zaki Ibrahim, Michie Mee and more. The festival will also include the participation of legendary hip hop forefather Afrika Bambaataa and the Zulu Nation, Mr. Wiggles, the Inside Out Project, and Indigo. Manifesto will once again transform the city for 11 days into a hotbed of youth culture igniting 13 venues with over 100 artists offering something for everyone. With constant new additions to the festival, Manifesto returns bigger and more exciting than ever! Stretch BEFORE you come, lol. An evening celebrating street dance culture in Toronto through showcase performances, battles, open cyphers, and Toronto’s First B-Boy award ceremony. The event will take place in two rooms – one devoted to bboying/bgirling and the other to all styles of street dance. Special guest Mr. Wiggles will be performing in both rooms throughout the night. Also, in partnership with SCION, 15 car hoods painted by Toronto artists will be auctioned off at this event. Slinky/Moog Audio – 442 Queen St. W.
Looks like another great line-up for this Manifesto Festival headlining event. Created by Tara Muldoon and Gravity Affect, supported by Manifesto, Heeling Soul, PPEG and IMMNF, F-YOU has become an acclaimed Project that relieves the community of everyday egos, pride and image. Moving forward without looking back. Join us as we strip the layers of persona, ego and resentment to discuss what really matters: keeping it real. Included speakers: Bryan Espiritu, Ian Andre Espinet, Katrina Lopes, Latoya “JaneFrFinch” Rodney, Christine “Chris Jay” Jordan, DJ Miss Kittie. A panel of six people, a mix of race, age and gender, speaking about a time in their lives they had to for give either themselves or another. 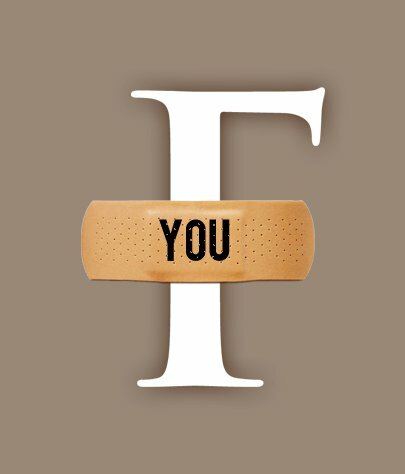 F-YOU is an inviting, tell-all event that aligns personal growth with self-improvement. This event has the potential to impact our community and young adults by way of real-life portrayals of hardships, and over coming barriers that at one point seemed insurmountable. Hearing first-hand trials and tribulations from people just like us can open the door to motivate and inspire us to do better, to be better, and most importantly, feel better. We at F-You share a desire to see more unity and confidence among our generation.. In a world filled with anger and resentment, it becomes easy to harden our hearts to the idea of letting go. Forgiveness is not permission, or predisposed justification – it is the release of detrimental feelings, thoughts and emotions that can consume us. F-You is a multi-faceted organization which includes panel-based community events, a T-shirt line and a collection of journals. The panel is an impassioned and inspiring event, featuring speakers who have overstepped the line between being a victim and being a sur vivor in the face of their own internal adversities. A true showcase of strength and inner character, F-You will reveal how forgiveness is the power to heal yourself and others by resisting blame and granting pardon to those who have wronged us. With guest speakers from every walk of life, including the ever-testing entertainment industry, F-You will encourage and empower all of us to let go… for no one other than ourselves. This is a craaaazy lineup – all going down tonight! Pioneers from four styles of sound system culture face with off in the city’s first ever cross-genre culture clash of that magnitude. Four DJ crews hailing from Los Angeles, London, New York and Toronto will be representing their sound on four different stages and sound systems, as they battle it out exciting a crowd of thousands to ultimately become the reigning champion of the Red Bull Music Academy World Tour – Culture Clash Toronto stop, as part of the critically acclaimed 11-day Manifesto Festival of Community & Culture. The Forum Barber – 5519 Yonge St.
showcase. 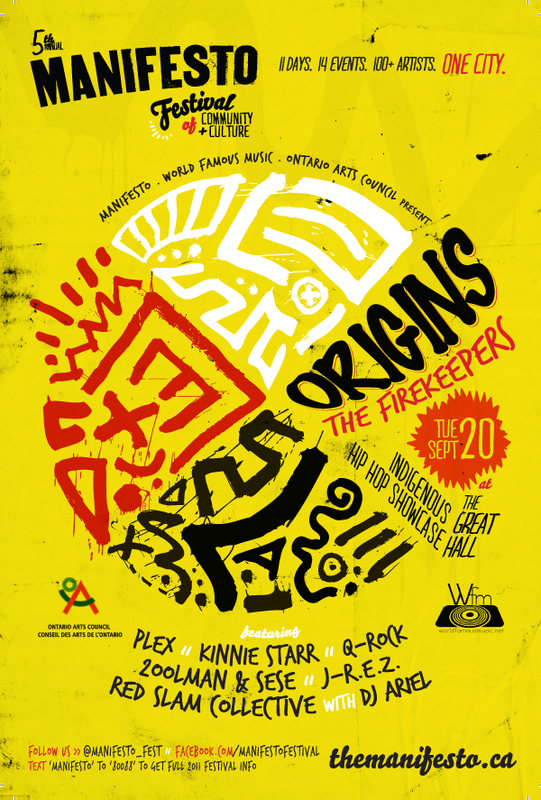 ORIGINS: The Firekeepers brings to together 6 Ontario based Indigenous artists/groups to recognize the talent among a segment of artists, who often receive minimal exposure to the mainstream Canadian market. The event also provides an artist development facet, where all the performers will have the opportunity to sit-in on a discussion regarding a number of topics related to the Canadian music industry. Tickets are 2 for $15 available at all Manifesto ticket outlets and online at ticketpicket.com. Part 2 of Jesse Jones’ “Conversations” series has him chopping it up with one of the first dudes from my generation to really take hip-hop choreography to the next level – Do-dat founder and SYTYCDC judge – Luther Brown, whose worked with the likes of Diddy, Brandy, Janet Jackson and Alicia Keys.